5. Institute of Automation, Chinese Academy of Sciences, Beijing 100190, China. Aims: To determine the effects of percutaneous coronary intervention (PCI) on cardiac perfusion, cardiac function, and quality of life in patients with chronic total occlusion (CTO) lesion in left anterior descending (LAD) coronary artery. Methods and Results: Patients (n=99) with CTO lesion in the LAD coronary artery who had successfully undergone PCI were divided into three groups based on the SPECT/CTCA fusion imaging: (a) no severe cardiac perfusion defects (n=9); (b) reversible cardiac perfusion defects (n=40); or (c) fixed cardiac perfusion defects (n=50). No statistical difference of perfusion abnormality was observed at 6 months and 1 year after PCI in group (a). 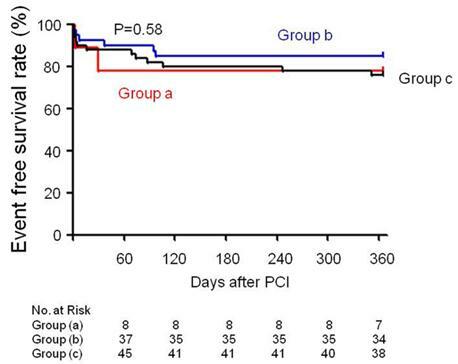 In group (b), SPECT/CTCA fusion imaging demonstrated that cardiac perfusion abnormality was significantly decreased 6 month and 1 year after PCI. Left ventricular ejection fraction (LVEF) increased significantly at 6 months and 1 year follow up. Quality of life improved at 6 months and 1 year after PCI procedure. Moreover, patients in group (c) also benefited from PCI therapy: a decrease in cardiac perfusion abnormality, an increase in LVEF, and an improvement in quality of life. PCI of coronary arteries in addition to LAD did not significantly affect cardiac function and quality of life improvement in each group. Conclusions: PCI exerts functional and clinical benefits in patients with CTO lesion in LAD coronary artery, particularly in patients with reversible cardiac perfusion defects. SPECT/CTCA fusion imaging may serve as a useful tool to evaluate the outcomes of patients with CTO lesion in LAD coronary artery. Keywords: Percutaneous coronary intervention, PCI, Chronic total occlusion, CTO, Single-photon emission computed tomography, SPECT, Computed tomography coronary angiography, CTCA. Over the past years, chronic total occlusions (CTO) recanalization has received much attention as one of the major frontiers of interventional cardiology. Coronary CTO are commonly encountered complex lesions which are identified in 15% to 30% of patients referred for coronary angiography [1,2]. The clinical approach for management of patients with CTO remains variable and controversial. However, currently there is a strong bias in favor of percutaneous coronary intervention (PCI) [3,4,5,6,7]. In recent decades, invasive coronary angiography (ICA) has been widely accepted as the gold standard in morphologic imaging detecting coronary artery disease. However, functional relevance of particular coronary artery lesions cannot be explained by ICA. Moreover, decisions regarding which strategy is the best for long-term survival in patients with CTO cannot be supported by anatomic information alone. Interestingly, noninvasive imaging modalities have shown high diagnostic accuracy in the detection of coronary artery lesions, and for the estimation of their hemodynamic relevance. Thus, noninvasive assessment of myocardial perfusion defects may be preferred for patients with CTO [8,9]. In particular, single-photon emission computed tomography (SPECT) & computed tomography coronary angiography (CTCA) fusion imaging can assess distinct aspects of heart morphology and function parameters of the heart, and should therefore be considered before formulating treatment strategies. The safety and efficacy of PCI on myocardial perfusion and functional outcome in patients with CTO remain to be conclusively determined. Therefore, the purpose of the present study was two-fold: To detect the hemodynamic relevant of coronary lesions and perfusion defects by SPECT/ CTCA fusion imaging; and to determine the effects of PCI on cardiac perfusion, cardiac function and quality of life in patients with CTO lesion in left anterior descending (LAD) coronary artery. The study design is shown in Fig 1. A detailed history, SPECT/CTCA fusion imaging, ultrasonic cardiography (UCG), 6-min walk distance (6MWD), angina class according to the Canadian Cardiovascular Society (CCS) classification, Seattle Angina Questionnaire and coronary angiography were recorded before PCI, and 6 months or 1 year after PCI treatment. All patients received medication in accordance with current guidelines for the management of patients with coronary artery disease (CAD) . Cumulative major adverse cardiac events (MACE), including cardiac death, coronary perforation, non-fatal myocardial infarction, stent thrombosis, cardiac tamponade, stroke and target lesion revascularization were also recorded. Flow chart outlining the study protocol. One hundred and thirty-nine patients with CTO lesion in the LAD coronary artery who underwent PCI as well as SPECT/CTCA fusion imaging were enrolled consecutively between Oct, 2008 and Oct, 2009. Patients were eligible for enrolment in this study if coronary angiography showed a CTO (for at least 3 months and confirmed by angiography and/or history of earlier MI). General exclusion criteria were hypersensitivity to iodinated contrast agent, cardiomyopathy, non-sinus rhythm, severe valvular heart disease, New York Heart Association (NYHA) functional class IV heart failure at baseline, renal insufficiency, severe lung and liver disease, and cancer. Patients who had successfully undergone PCI were divided into the following three groups: (a) no severe cardiac perfusion defects (n=9); (b) reversible cardiac perfusion defects (n=40); (c) fixed cardiac perfusion defects (n=50). Group (a) is defined as a LAD CTO lesion without any associated myocardial ischemia. Group (b) and group (c) are defined as a CTO lesion with LAD coronary artery inducing a reversible or fixed cardiac perfusion defect in its subtending myocardial territory on myocardial perfusion imaging (MPI), respectively (Figure 1). All the patients underwent adenosine-stressed and rest-gated SPECT MIBI before the PCI procedure, and 6 months or 1 year after the PCI, at which time the angiography was also repeated. The protocol has been registered at https://register.clinicaltrials.gov (ClinicalTrials.gov number, NCT01254253). The study protocol conforms to the ethical guidelines of the 1975 Declaration of Helsinki as reflected in a priori approval by the Ethics Committee of Fourth Military Medical University. Risks of radiation exposure were explained in detail to all the patients. All of the patients gave written, informed consent. An independent data and safety monitoring board was informed of adverse events as they occurred. The authors of this manuscript have certified that they comply with the Principles of Ethical Publishing in the International Journal of Cardiology: Coats AJ and Shewan LG. Ethics in the authorship and publishing of scientific articles. Int J Cardiol 2011;153:239-40. PCI was performed using standard techniques for CTO. The selection of guiding catheters, guide wires, balloons, stents during intervention was left at the discretion of the operator. The outcome of PCI was determined according to the angiography performed 6 months and 12 months after PCI. Successful PCI was defined as a Thrombolysis in Myocardial Infarction (TIMI) flow grade of 2 or 3 of the LAD artery and less than 50% residual stenosis. Qantitative coronary angiography (QCA) was evaluated and performed with GE QCA software (GE Innova 2000, Fairfield, USA) as previously described . Coronary artery restenosis was defined as more than 50% loss of luminal diameter within stents at follow-up. Coronary angiography was performed according to standard techniques and evaluated by two experienced observers who were blinded to the results from CTCA and MPI. If a discrepancy between the readings of >5% was noted, a third blinded observer was called to achieve a consensus. A two-day rest-stress Tc-99m sestamibi ECG-Gated SPECT myocardial perfusion imaging (MPI) protocol was performed, with a weight-adjusted dose of 750 to 900 MBq of Tc-99m sestamibi at rest and at peak stress on the another day respectively. Briefly, the scans were obtained sequentially. CT scan obtained immediately after MPI on a dual-head hybrid SPECT/CT with two-slice spiral CT scans (Symbia TruePoint™ T2, Siemens Medical Solutions, Germany). For the attenuation map and orientation, CT(x-ray tube current, 45 mAs; voltage, 130 kV) with a slice thickness and axial resolution of 5 mm, covering only the region of the heart to reduce radiation exposure to the patients , were obtained without enhanced scan and breath-hold. In this protocol, two imaging series were obtained: gated-MPI and attenuation correction CT (ACCT). As these two sets of images were obtained sequentially, they matched with relative accuracy. MPI analysis was performed using software called Cedars (Cedars QGS/QPS; Cedars-Sinai Medical Center, Los Angeles, CA). For CTCA, 80 mL of iodixanol (Visipaque 320, 320 mg/mL, GE Heathcare, Buckinghamshire, UK) was injected into an antecubital vein. All CTCA scans were performed on a dual source 64-slice CT scanner (Somatom Sensation 64; Siemens Medical Solutions, Forchheim, Germany) (DSCT). Computed tomography data sets were retrospectively reconstructed in mid- to end-diastolic phases and additional phases if needed for optimal coronary artery visualization. CTCA images were qualitatively graded by two independent readers who were blinded to the results of SPECT. where c and μ are the intensity and attenuation rate calculated from CT value and e was the emission intensity calculate from the SPECT data using a color map. The functional image and the structural image were manually aligned in the 3D space. For the alignment of the functional and structural images, the rendering engine allowed the two parts to be transformed independently from each other. During the alignment, the feature of the inner left ventricular wall served as the major hint. The scene was viewed from different aspects to check the match. Ultrasonic cardiography (UCG) was recorded as previous described . A HDI 5000 scanner and an iE 33 scanner (Philips Ultrasound, Washington, USA) were used. Four consecutive cineloops of four apical views were recorded to analyze left ventricular volumes. End-systolic volume (ESV), End-diastolic volume (EDV), and Left ventricular ejection fraction (LVEF) were calculated using the modified Simpson`s rule according to current guidelines. Two experienced ultrasound technicians unaware of treatment allocation processed all recordings. If a discrepancy between the readings of >5% was noted, a third blinded observer was called to reach a consensus. Quantitative variables were expressed as means ± SD or means ± SEM and categorical variables as frequencies and percentages. Statistical comparison of quantitative variables was performed using an Student's t-test or One-way ANOVA or Mann-Whitey U test where appropriate, and comparison of categorical data was performed using a Chi-square test or Fisher's exact test, as appropriate. P values <0.05 was considered to indicate statistical significance, with all reported p-values being two-sided. Statistical analysis was performed using the SPSS software package (SPSS 14.0 for Windows, Chicago, IL). 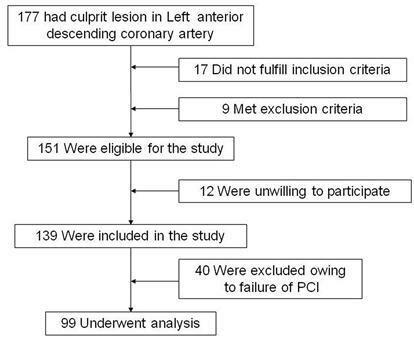 One hundred and thirty-nine patients with CTO lesion in the LAD coronary artery who underwent PCI as well as SPECT/CTCA fusion imaging were enrolled in the study, but 40 (28.8%) had to be excluded due to failure of LAD patency (Fig 1, 2). The final analysis included 99 patients. SPECT analysis revealed 9 normal, 40 reversible, and 50 fixed perfusion defects in 99/139 patients. There were no major differences between the two groups in terms of patient characteristics (Table 1). Clinical characteristics of the study population. Values are presented as mean ± SEM or number or proportion. PCI of the occlusion was attempted in 139 patients and was successful in 99 (71.2%) with a TIMI flow grade of 3. At least one stent was placed in these patients. All of the patients received drug-eluting stents. PCI of an artery other than the LAD artery was performed in 22.2 % (2/9) of the patients in group (a), 45% (18/40) in group (b), and 78% (39/50) in group (c). Event-free survival rates had no statistical difference between these groups (Group (a) 77.8% vs Group (b) 85% vs Group (c) 76%, p=0.58) (Figure 3). PCI related severe complications and MACE were showed in Table 2. During the follow-up period, 1 case in group (b) (2.5%) and 1 case in group (c) (2%) experienced cardiac death. As for severe PCI complications, 1 case in group (b) (2.5%) and 2 cases in group (c) (4%) experienced coronary perforation. Cardiac tamponade occurred in 1 case in group (b) (2.5%) and 2 cases in group (c) (4%) at 1 year follow-up. The ratio and timing of stent thrombosis in the present study is 11.1 % in group (a) (3 days after PCI), 5 % in group (b) (1, 4 days after PCI) and 6 % in group (c) (1, 3, 16 days after PCI). Quantitative coronary angiography evaluation showed that minimum luminal diameter, lesion length and diameter stenosis had no statistical difference in each group during the follow-up period (Table 3). SPECT/CTCA fusion image were indicated in a representative patient in group (b) from baseline to 1 year after PCI. LAD lesion was confirmed by CTCA imaging (Fig 4A, 4B). SPECT/CT fusion image was shown in Fig 4C, 4D, 4E. Three-dimensional SPECT/CTCA fusion images revealed severe anterior wall perfusion defects in the patient with LAD CTO lesion (Fig 4F). Myocardial perfusion SPECT after pharmacological stress and at rest showed a reversible anterior perfusion defect. Cardiac perfusion abnormality was significantly improved at 1 year follow up after PCI in group (b) (Fig 4G-4J). 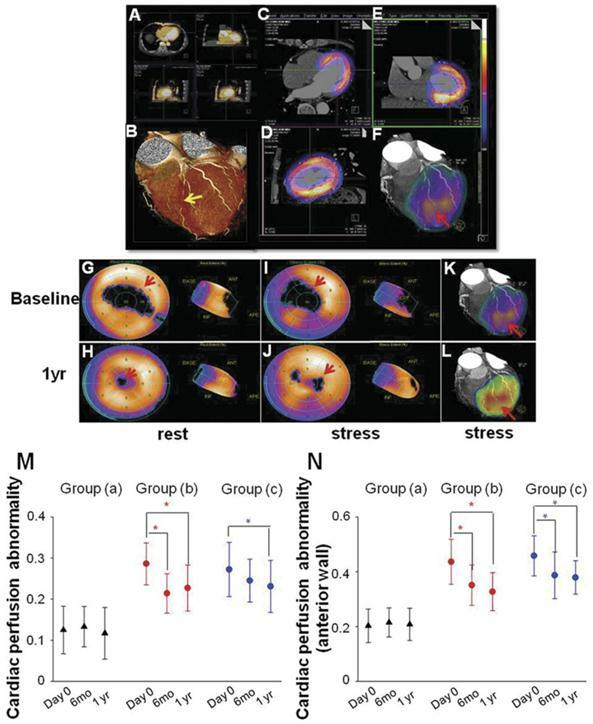 Three-dimensional SPECT/CTCA fusion images visualize improved cardiac perfusion at 1 year follow up after PCI in group (b) (Fig 4K, 4L). *P<0.05 vs group a, #P<0.05 vs group b. Values are presented as mean ± SEM. Baseline: QCA data collected right after successful PCI. Event free survival rate recorded in each group. SPECT/CTCA fusion imaging and myocardial perfusion imaging. SPECT/CTCA fusion image were indicated in a representative patient in group (b) from baseline to 1 year after PCI. CTCA imaging confirmed LAD lesion (A, B, yellow arrow). SPECT/CT fusion image showed myocardial perfusion defects (C, D, E). Three-dimensional SPECT/CTCA fusion images revealed severe anterior wall perfusion defects (F, red arrow). Myocardial perfusion SPECT after pharmacological stress and at rest showed a reversible anterior perfusion defect. Cardiac perfusion abnormality was significantly improved at 1 year follow up after PCI in group (b) (G, H, I, J). Three-dimensional SPECT/CTCA fusion images visualize improved cardiac perfusion at 1 year follow up after PCI in group (b) (K, L, red arrow). Cardiac perfusion abnormality was not significantly reduced at 6 months and 1 year follow up in group (a). Cardiac perfusion abnormality was significantly improved at 6 months and 1 year follow up after PCI in group (b). The similar trend was found in group (c) (M). Cardiac perfusion abnormality of left ventricular anterior wall was also significantly improved at 6 months and 1 year follow up after PCI in group (b) as well as in group (c) (N). *p<0.05 vs baseline. In group (a), cardiac perfusion abnormality was not significantly changed at 6 months and 1 year follow up after PCI procedure (baseline: 0.125 ± 0.058 vs 6 mo: 0.133 ± 0.049 vs 1 yr: 0.117 ± 0.063, P=0.731). Cardiac perfusion abnormality was significantly improved at 6 months (0.214 ± 0.048 vs 0.286 ± 0.051, P<0.001) and 1 year (0.227 ± 0.056 vs 0.286 ± 0.051, P<0.001) follow up after PCI in group (b) (Fig 4M). A similar trend was found in group (c), as cardiac perfusion abnormality was decreased 6 months (0.245 ± 0.052 vs 0.272 ± 0.066, P=0.059) and 1 year (0.231 ± 0.063 vs 0.272 ± 0.066, P=0.041) after PCI procedure (Fig 4M). In order to exclude the confounding effects caused by PCI of an artery other than the LAD, cardiac perfusion abnormality of left ventricular anterior wall were also calculated. Cardiac perfusion abnormality of anterior wall was also significantly improved at 6 months (0.351 ± 0.074 vs 0.436 ± 0.082, P<0.001) and 1 year (0.327 ± 0.069 vs 0.436 ± 0.082, P<0.001) follow up after PCI in group (b) as well as in group (c) 6 months (0.387 ± 0.085 vs 0.458 ± 0.073, P<0.001) and 1 year (0.379 ± 0.061 vs 0.458 ± 0.073, P<0.001) after PCI (Fig 2N). LVEF, ESV, and EDV were evaluated by echocardiography. Compared with baseline, no statistical difference of LVEF was observed 6 months (0.552 ± 0.062 vs 0.578 ± 0.093, P=0.502) and 1 year (0.567 ± 0.044 vs 0.578 ± 0.093, P=0.750) after PCI in group (a). In group (b), LVEF was significantly enhanced as evaluated by echocardiography (0.529 ± 0.071 % vs 0.477 ± 0.084 %, P=0.004) 6 months after PCI compared with baseline. LVEF was also improved as evidenced by echocardiography (0.537 ± 0.086 vs 0.477 ± 0.084, P=0.002) 1 year after PCI in group (b). LVEF was measured at 6 months (0.477 ± 0.62 vs 0.441 ± 0.086, P=0.018) and 1 year (0.482 ± 0.059 vs 0.441 ± 0.086, P=0.006) follow up and found to have increased significantly in group (c) compared with baseline (Fig 5A, 5B). ESV measured at 6 months (56.5 ± 9.9 vs 65.4 ± 12.4, p<0.001) and 1 year (54.3 ± 11.7 vs 65.4 ± 12.4, p<0.001) follow up was significantly decreased in the group (b) as compared with baseline. In group (c), ESV was also decreased at 6 months (63 ± 9.2 vs 67.7 ± 11.3, p=0.025) and 1 year (62.7 ± 10.2 vs 67.7 ± 11.3, p=0.022) follow up as compared with baseline. No significant differences of ESV were observed in group (a) (baseline: 51.8 ± 13.6 vs 6 mo: 51.4 ± 7.6 vs 1 yr: 51.1 ± 6.2, P=0.913) (Fig 5C, 5D). There was a statistically significant decrease in EDV 6 months (120.8 ± 9.2 vs 125.6 ± 10.3, p=0.033) and 1 year (118.1 ± 10.5 vs 125.6 ± 10.3, p=0.002) after PCI procedure in group (b) as compared with baseline. No significant differences in EDV were observed in group (a) and group (c) (Fig 5E, 5F). Quality of life improved as evidenced by 6-min walk distance (6MWD) at 6 months (432.4 ± 32.9 m vs 390.1 ± 27.6 m, P<0.001) and 1 year (442.3 ± 27.3 m vs 390.1 ± 27.6 m, P<0.001) follow up in group (b) (Fig 5G, 5H). 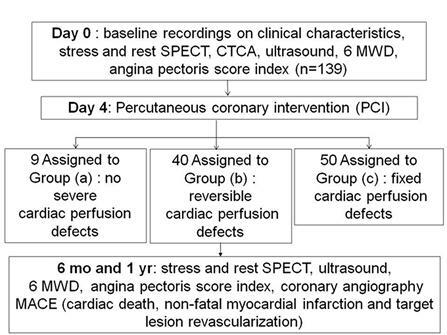 The basal evaluation results of angina pectoris after 6 months and, 1 year are summarized in Table 4. A significant difference in angina attacks was observed, with group (b) showing a greater reduction 6 months and 1 year after PCI procedure compared to baseline as evidenced by Seattle Angina Questionnaire scores and CCS class. Moreover, patients' quality of life in group (c) also improved after PCI therapy, with an increase in 6MWD and decrease in angina pectoris onset during the follow up period. Data obtained by echocardiography, 6MWD, Seattle Angina Questionnaire scores and CCS class were subjected to subgroup analysis. Patients were divided into PCI of the LAD artery and PCI of arteries in addition to the LAD artery in each group respectively. LVEF, ESV, EDV and 6MWD had no statistical significance between subgroups at baseline and at 6 months and 1year follow-up (Fig 6). No statistical difference of LVEF, ESV, EDV and 6MWD was observed 6 months and 1 year after PCI in group (a) compared with baseline (Fig 6A). LVEF was significantly enhanced at 6 months (0.518 ± 0.075 vs 0.449 ± 0.074, P<0.001) and at 1 year (0.542 ± 0.106 vs 0.449 ± 0.074, P<0.001) after PCI in patients with PCI of the LAD artery in group (b). LVEF was also significantly enhanced at 1 year (0.535 ± 0.082 vs 0.485 ± 0.086, P<0.001) follow-up in patients with PCI of arteries in addition to the LAD artery in group (b). Similar trend of LVEF change was also recorded in each subgroup in group (c) as group (b) (Fig 6A). ESV measured at 6 months and 1 year follow up were decreased in patients with PCI of the LAD artery in the group (b) and group (C) as compared with baseline (Fig 6B). There was a significant decrease in EDV 1 year (117.1 ± 8.6 vs 126.4 ± 9.4, P<0.001) after PCI procedure in patients with PCI of arteries in addition to the LAD artery in group (b) (Fig 6C). 6MWD were also significantly increased at 6 months and 1 year follow-up in each subgroup in group (b) and group (c) (Fig 6D). A similar trend of angina attacks as evaluated by Seattle Angina Questionnaire scores and CCS class were observed in each subgroup in group (b) and group (c) (Table 3). Changement of LVEF, ESV, EDV and 6MWD. (A, B) LVEF measured at 6 months and 1 year follow up was found to have increased significantly in group (b) and group (c) compared to their baseline respectively (C, D). 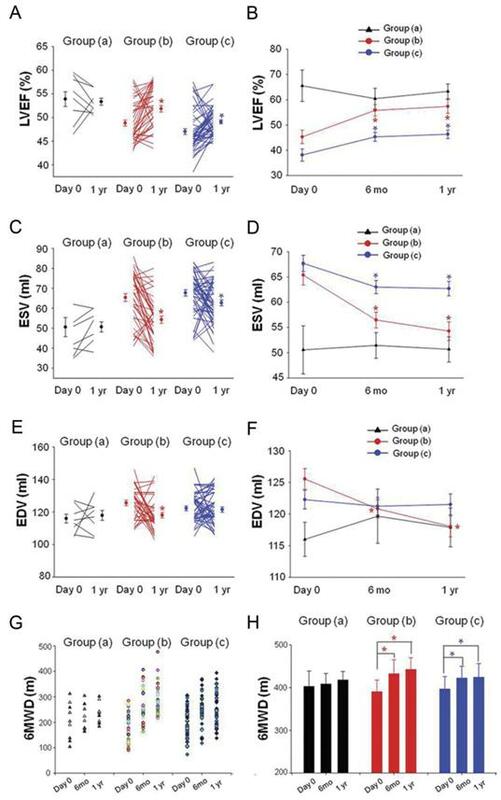 ESV were decreased significantly in group (b) and group (c) at 6 months and 1 year follow up (E, F). EDV were decreased significantly in group (b) at 6 months and 1 year follow up. LVEF: left ventricular ejection fraction; ESV: end systolic volume, EDV: end diastolic volume. Solid circles represent the mean, T bars the standard error (SE) in A, C, E, T bars the standard deviation (SD) in B, D, F. Quality of life improved as evidenced by 6-min walk distance (6MWD) at 6 months and 1 year follow up in group (b) and group (c) (G, H). *p<0.05 vs baseline. Subgroup analysis. No statistical difference of LVEF, ESV, EDV and 6MWD was observed 6 months and 1 year after PCI in group (a) compared with baseline (A). LVEF was significantly enhanced at 6 months and at 1 year after PCI in patients with PCI of the LAD artery in group (b). LVEF was also significantly enhanced at 1 year follow-up in patients with PCI of arteries in addition to the LAD artery in group (b). Similar trend of LVEF change was also recorded in each subgroup in group (c) as group (b) (A). 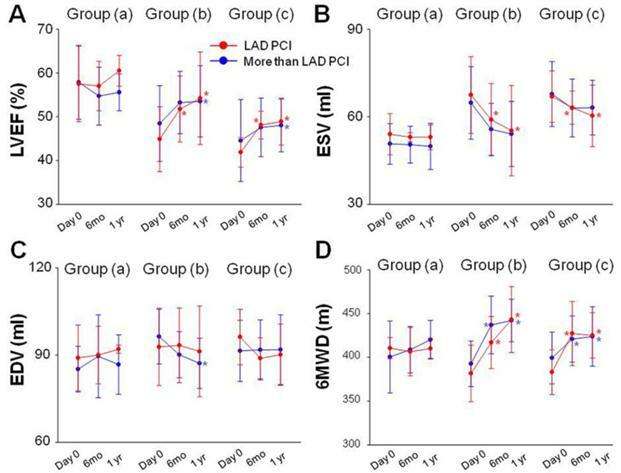 ESV measured at 6 months and 1 year follow up were decreased in patients with PCI of the LAD artery in the group (b) and group (C) as compared with baseline (B). EDV decreased 1 year after PCI procedure in patients with PCI of arteries in addition to the LAD artery in group (b) (C). 6MWD were also significantly increased at 6 months and 1 year follow-up in each subgroup in group (b) and group (c) (D). Solid circles represent the mean, T bars the standard deviation (SD). *p<0.05 vs baseline. Data were presented as mean±standard deviation. The a/b/c 1 indicated patients with PCI of the LAD artery and a/b/c 2 indicated patients with PCI of arteries in addition to the LAD artery. *P<0.05 vs baseline, #P<0.05 vs a/b/c 1. In the present study, SPECT/CTCA fusion imaging demonstrated that cardiac perfusion abnormality was significantly decreased 6 month and 1 year after PCI in patients with reversible cardiac perfusion defects (group b). PCI significantly increased LVEF and improved quality of life during the follow up period in patients with reversible cardiac perfusion defects (group b). The similar findings were also indicated in patients with fixed cardiac perfusion defects (group c). Furthermore, PCI of coronary arteries in addition to LAD did not significantly affect cardiac function and quality of life improvement in each group. Chronic total occlusion (CTO) , a common condition in patients with coronary disease, represents one of the most challenging targets of lesion recanalization for percutaneous coronary interventions (PCI) at the present time [14,15]. Because of its complexity, CTO PCI is associated with lower rates of procedural success, higher complication rates, greater radiation exposure, and longer procedure times compared with interventions in non-CTO stenosis. Despite these obstacles, reported benefits of successful CTO PCI include a reduction in symptoms and improvement in both ventricular function and survival [16,17,18,19]. Safety is always an important concern for CTO PCI. Some peculiarities of stenting in CTO that deserve attention are the absolute absence of endothelial cells, the exposure of deep plaque components at the site of stenting, and the frequent need to stent long coronary segments. Thus, severe complications such as cardiac tamponade, coronary perforation, and in-stent thrombosis have always been problematic for this procedure. The expected benefits of restoring flow against the risks and challenges inherent to the procedure should be evaluated before making the treatment decision . In the present study, recanalization was successful in 71.2% of cases. The average CTO lesion lengths are significantly different among these three groups. Reference vessel diameter had no statistical difference among groups. Patients in group (a) had abundant coronary bridging collaterals. Patients in group (b) and group (c) had more complicated coronary lesion. 45% of patients in group (b) and 78% in group (c) underwent PCI of an artery other than the LAD. The relative lower rates of PCI related complication might have been caused by the drug-eluting stents (DES) implantation. The introduction of DES, which has been demonstrated to cause less restenosis than bare-metal stents (BMS) in specific patient and stenosis subsets, has raised hopes of improving long-term vessel patency after CTO recanalization . In our study, 100% of patients used drug-eluting stents (DES). This advantage is also supported by an meta-analysis from Humberto and colleagues , which suggests that the use of DES in CTO recanalization is associated with significantly fewer major adverse cardiac events (MACE) and fewer occurrences of target vessel revascularization, restenosis, and stent reocclusion than with BMS. Although a statistical trend toward a higher risk of stent thrombosis was observed, the use of DES in this context seems to be safe, with an overall benefit sustained in the long term . In the present study, quantitative coronary angiography evaluation also showed that minimum luminal diameter, lesion length and diameter stenosis had no statistical difference in each group during the follow-up period. In patients with ischemic coronary disease, there is a well-documented correlation between survival and left ventricular function. The hypothesis that improved left ventricular function is in part responsible for the survival advantage seen in patients who achieve long-term vessel patency following CTO PCI is supported by several reports. It is possible that the localization of CTO is the key factor affecting survival benefit. In our study, we only enrolled patients with LAD CTO. Interestingly, Safley et al. recently found greater benefit in survival with left anterior descending artery recanalization compared with circumflex and right coronary artery CTO recanalization . In our study, global myocardial perfusion significantly improved in patients with reversible and fixed myocardial perfusion defects. Since a large proportion of patients underwent PCI of another lesion in addition to the LAD in group (b) and group (c), 45% and 78% respectively, we analyzed anterior wall myocardial perfusion to avoid a major bias due to PCI in other vessels. Cardiac perfusion abnormality of anterior wall was also significantly improved at 6 months and 1 year follow up after PCI in group (b) as well as in group (c). LVEF was significantly enhanced, and ESV and EDV were statistically reduced at 6 months and 1 year follow up after PCI in patients with reversible myocardial perfusion defects. LVEF was also increased in patients with fixed myocardial perfusion defects 6 months and 1 year after PCI. Compared with baseline, LVEF, ESV and EDV did not differ significantly among patients without severe myocardial perfusion defects. Moreover, a strong statistical trend toward better clinical outcomes of patients with reversible cardiac reperfusion defects after a successful recanalization of their coronary artery was documented. Patients with fixed cardiac reperfusion defects can also benefit from a patent coronary artery. Data obtained by echocardiography, 6MWD, Seattle Angina Questionnaire scores and CCS class were subjected to subgroup analysis in order to make sure that the observed improvements were not only due to additionally underwent PCI of other lesions than the LAD. Patients were divided into PCI of the LAD artery and PCI of arteries in addition to the LAD artery in each group respectively. LVEF, ESV, EDV and 6MWD had no statistical significance between subgroups at baseline and at 6 months and 1year follow-up in each group. Similar trend of cardiac function and quality of life improvements were observed in each subgroup in group (b) and group (c) indicating that LAD patency is the most important factor contributing to the cardiac function and quality of life improvements in these patients. A growing body of studies have shown that the mechanisms by which PCI of an occluded infarct-related artery might improve outcomes include reduction in adverse left ventricular remodeling with preservation of left ventricular function, increased electrical stability, and provision of collateral vessels for protection against future events [24,25,26]. Patients with reversible and fixed perfusion defects might benefit more from PCI procedure due to the improvements in myocardial blood flow and in the contractility within the affected myocardium. CTO patients without significant myocardial perfusion defects usually have a short anatomic coronary lesion, abundant collaterals, and less angina pectoris presentation. Optimized medical therapy is recommended in these patients as compared with PCI procedure. In this regard, imaging modalities to determine functional relevant coronary artery lesions may be needed to estimate the benefit versus risk of CTO PCI. Novel imaging techniques such as SPECT can be used to measure myocardial perfusion. CTCA with dual-source scanners can reveal the anatomic location of coronary artery disease (CAD). We combined these two techniques to assess distinct aspects of heart morphology and functional parameters of the heart by SPECT/CTCA data registration. Our results showed that SPECT/CTCA registration before PCI can help formulate better treatment strategies in patients with coronary chronic total occlusion. The present study indicated that PCI provides functional and clinical benefits in patients with CTO lesion in LAD coronary artery, particularly in patients with reversible cardiac perfusion defects. SPECT/CTCA fusion imaging may serve as a useful tool to evaluate the outcomes of patients with CTO lesion in LAD coronary artery. However, based on the observational nature of the evidence, randomized control trials comparing recanalization to a planned medical management are needed to confirm these findings. Patients enrolled in this study are a highly selected population with LAD CTO and the sample size is small. Thus, large-scale clinical trials with different lesion locations should be tested to generalize our results further. The detailed mechanism for functional and clinical benefits of PCI in patients with reversible or fixed myocardial perfusion defects still remains to be clarified. Another important drawback of non-invasive cardiac imaging is the relatively high radiation exposure associated with CTCA and MPI. This additional radiation exposure may be avoided or reduced with the development of more effective evaluation strategies before treatment decisions are made. This work was supported by National Nature Science Foundation of China (No. 81090274, No. 81090270, No. 81100579), Innovation Team Start-up Grant by China Department of Education (2010CXTD01) and China's Ministry of Science and Technology 863 Program (2012AA02A603). Corresponding author: Feng Cao, Department of Cardiology, Xijing Hospital, Fourth Military Medical University, Xi'an, Shaanxi, 710032, China. Tel: 86-29-84771024, Fax: 86-29-84771024 E-mail: wind8828com (FC), fengcaoedu.cn.